If you have any questions or want to enquire about dates, use our form to contact Piers Baker or see their website for more information. This perennial favourite sits in an idyllic village made rich by mills in the 16th century. You’re also in Constable country – the artist attended school in the village and often returned to paint the church. Best of all is the river – you can hire boats, grab a picnic from the inn, float down the sleepy Stour, then tie up on the bank for lunch al fresco. As for The Sun, you couldn’t hope to wash up in a better spot. Inside, you find open fires, boarded floors, timber frames and an easy elegance. A panelled lounge comes with sofas and armchairs, the bar is made from a slab of local elm and the airy, beamed dining room offers fabulous food inspired by Italy, perhaps crab ravioli, squid with chilli and garlic, monkfish with truffle mash, chocolate mousse with Morello cherries. Bedrooms are gorgeous: creaking floorboards, timber-framed walls, a panelled four-poster. Those at the back are bigger and come in grand style, but all are lovely with crisp linen, local art and power showers in excellent bathrooms. There’s afternoon tea on arrival if you book in advance and a garden for a pint in summer. Lunch from £10.95. Dinner from £16.95. Not Monday lunch. Dinner, B&B £100-£125 per person. Extra bed/sofabed available £15 per person per night. I stayed at the Sun Inn at the beginning of a three week trip around England and I must say, I could not have picked a better place if I'd tried! When I woke up with a splitting head ache the first morning, a perfect breakfast and quiet, yet so friendly service literally saved my day. I returned for dinner at the end of my journey and had the same warm welcome again - even though the place was very busy. Didn't get to meet the ghost which was I pity so I guess I'll have to return until I do ;o) . All in all, great room, food, service and atmosphere... I will recommend it to anyone! 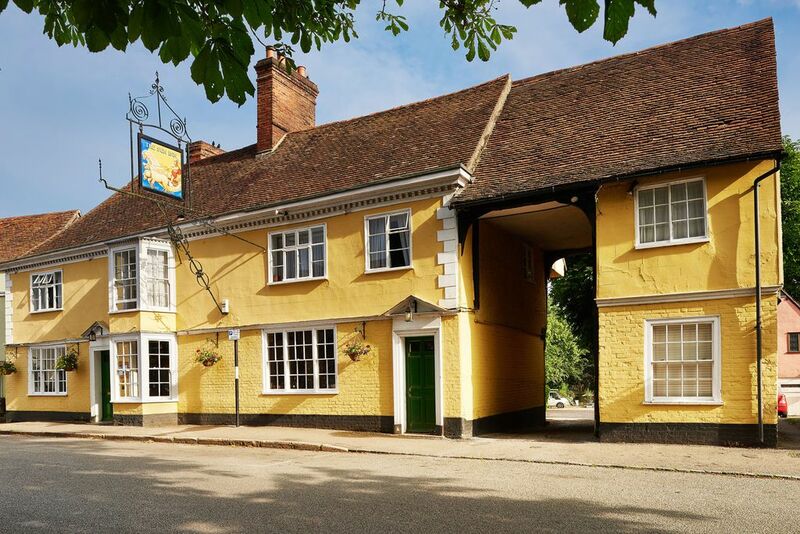 I have just come back from staying at the Sun Inn at Dedham, Essex, recommended by you. As always with a Sawday place, it was fabulous - in this instance even more fabulous that I could have imagined. Gorgeously decorated and furnished bedroom, the Dovecot and wonderful dinner and breakfast. The staff were lovely too (even when I accidentally left with my room key and couldn’t return it for some hours).